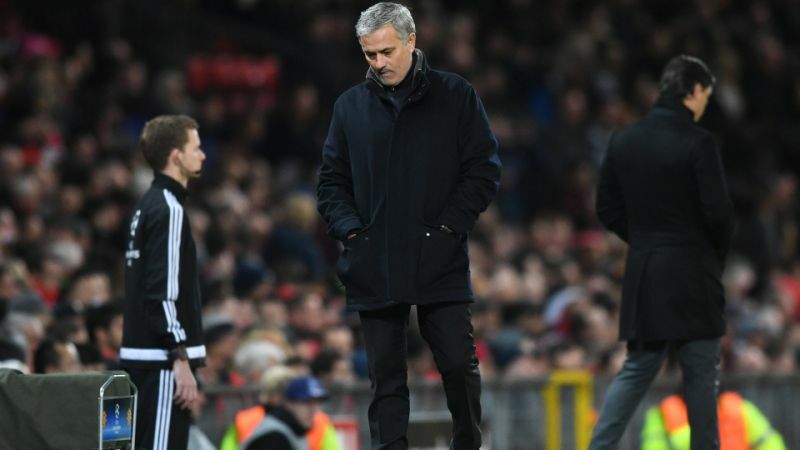 Mourinho admitted on the eve of the game that were not yet the best team left in the competition and have plenty of work to do before they can re-establise themselves as a European force. And their disjointed display in the second leg of the last 16 tie underlined it. Two goals from Sevilla super sub Wissam Ben Yedder in the space of four minutes late in the second half left Untied needing three to go through to the last eight. And although Romelu Lukaku pulled one back to spark a late fightback, it was too little too late on a night when United paid for defensive hesitancy. With the Premier League title already heading to the Etihad, it leaves United needing to lift the FA Cup to ensure some silverware in Mourinho’s second season in charge. Sevilla had consistently threatened to exploit a hesitant United defensive display but it was not until Ben Yedder’s entrance into the game after 72 minutes that they found the cutting edge. He finished off a fine move weith a low shot in the 74th minute and added a header after a mistake by David de Gea for the second. Lukaku fired in from a Marcus Rashford corner but United could have complaints - and Ben Yedder was denied ahat-trick in added time by De Gea after he was sent clean through. United made a fast and aggressive start to the game looking for an early goal with Lukaku setting the tempo. The Belgian chased Ashley Young’s pass down the left, bullied Simon Kjaer off the ball, exchanged passes with Jesse Lingard but, with time and space to get a shot at least on target, he curled his effort high and wide. A fine block by Clement Lenglet then stopped Lukaku from converting Lingard’s cross before Marcus Rashford’s long-range free-kick was saved by Sergio Rico. Sevilla looked unsettled and midfielder Ever Banega picked up a caution for chopping down Alexis Sanchez. But the Spaniards weathered the early storm and reminded United of the attacking threat they had shown in the first leg. Joaquin Correa glanced a header just over the bar and on three occasions Luis Muriel had decent openings but was twice off target with shots while the other effort was comfortably saved by De Gea. United did not help themselves with some nervy defending and loose possession but Seville were also guilty of some sloppy play in a scrappy spell that prompted Mourinho to come to the touchline to urge his players to have more composure on the ball. Rashford had deservedly his place after his two-goal display on Saturday and looked United’s best outlet with his pace, underlined by one tremendous surge past two opponents but for the msot part Seville kept him on a tight leash. United regained control towards half-time and Marouane Fellaini, recalled for youngster Scott McTominay, came close to making the breakthrough. He played a one-two with Lingard but keeper Rico saved his goal-bound shot. That sparked a spell where United peppered the Sevilla penalty area with crosses and shots but their final ball often lacked quality and the half ended goal-less. United survived a major scare early in the second half when Eric Bailly had to make a tremendous last-ditch tackle to stop Correa from scoring after Pablo Sarabi had exploited a gaping hole in the middle of United’s defence. If Bailly had got his timing wrong, it would have been a certain penalty. But it was spot-on and United breathed again. Bailly and Nemaja Matic however were involved in a heated exchange as to how Correa was left unmarked and it was a reminder of the importance of complete defensive concentration with the game balanced on a knife-edge. United responded by going close themselves, Lingard’s angled shot palmed to safety by Rico and Rashford’s low cross skidding right through the six yard box. The gloves were off now and back came Seville with the ever-dangerous Correa making a jinking run into Untied’s penalty area with a half-hit shot that rolled a yard wide of the far post. United needed more quality in the final third and Pogba entered the fray for Fellaini after an hour to huge cheers. And he wasn’t far away from breaking the deadlock with a long-range drive that curled a yard wide. Sevilla continued to look dangerous though on the break and from one superb move they took the lead through Ben Yedder, who had only been pon the pitch a few minutes. Mourinho responded by sending on Juan Mata and Anthony Martial for Lingard and Valencia but sfter Ben Yeddrr added his second it was all over, even thogh Lukaku pulled one back with his 25th of the season. Man Utd (4-2-3-1): De Gea; Valencia, Bailly, Smalling, Young; Fellaini, Matic; Lingard, Sanchez, Rashford; Lukaku. Sevilla (4-2-3-1): Rico; Mercado, Kjaer, Lenglet, Escudero; N’Zonzi, Banega; Sarabia, Vazquez, Correa; Muriel. Booked: Banega.